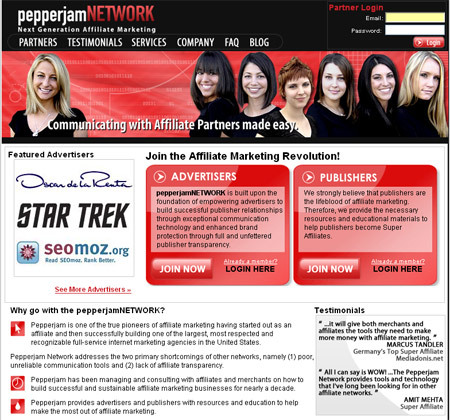 You’ve probably seen the Pepperjam Network splashed all over the affiliate and money making blogs today. The reason is they’ve just launched their new Affiliate Network and are promoting it with a massive web blitz, that’s why they’ve ordered this ReviewMe review. One of the most important things with any affiliate network that wants to be successful is transparency with the affiliates. Pepperjam have made giant steps towards this by detailing every aspect of their business on their own network blog. The network already has some fairly big merchants on board, including Blockbuster and the bloggers’ favourite ReviewMe. When I signed up for the network as a publisher I was presented with the all too familiar US focused sign up forms. 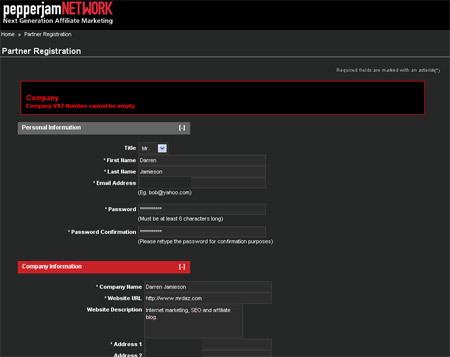 This is a pet hate of mine, but at least Pepperjam’s did have a stab at making it easier for non US based affiliates. The problem was though is that it forced me to enter a VAT number, which is apparently essential for EU based affiliates. I’m not VAT registered, never have been. I don’t have a VAT number. However I couldn’t proceed without adding one, so I had to make one up. I’m sure there’s an element of illegality in doing that, but hey ho. I’ll certainly give the network a chance, but at the moment it is very US focused. If it starts to creep into my site network and oust networks such as CJ and Affiliate Window I’ll let you know. Pepperjam is an industry leading full-service internet marketing agency offering marketing services and advanced technology in the areas of pay-per-click, search-engine optimization, affiliate marketing, and online media planning and buying. The company was founded in 1999 by internet marketing expert, conference speaker, and published author Kristopher B. Jones. Pepperjam has received numerous awards and achievements, including recognition by Inc. Magazine for two consecutive years as one of the fastest growing privately-held businesses in the United States. Learn more at www.pepperjam.com. We will address the VAT issue with the programming team. Thanks for bringing it to our attention! Nice! I’ve been following Pepperjam for awhile and I’ve heard Kris Jones speak. I’m going to check this out. Sounds like a great way to make some money.